Singapore Airlines (SIA) stories of stewardesses, stewards of more than 10 years by Boh Tong : Hit by lightning but dun scared la! Hit by lightning but dun scared la! 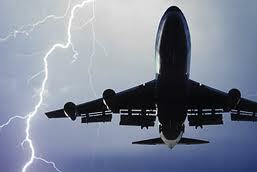 Some years ago, I encountered one nasty incident of our plane a B747 being hit by lightning. It happened when we were flying into London's Heathrow International Airport. The pilots tried to avoid the storm clouds but were unsuccessful. It was dreadful because the plane was being tossed up,down and sideways. Passengers were throwing out and a few were screaming in fear. The cabin crew were all fastened in and not allowed to leave their seats. At that time, I was in the first class cabin, seated next a young passenger. When you fly with SIA, the cabin crew will make an announcement asking all passengers to fasten their seat belts when the "fasten seat belt" signs are switched on.But when you hear the pilot asking the cabin crew over the PA to take their stations it means there is going to be a severe storm. On this particular flight, we were asked to fasten in. The weather was bad and there was flashes of lightning outside the plane. Suddenly, there was an explosion, a loud sound I mean.....yes we were hit by lightning. Many screamed and some thought the plane was going to crash. Frankly, I was a bit scared but I knew that hitting by a lightning was not a big deal. 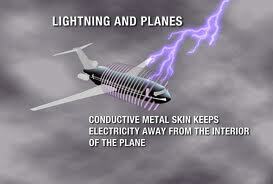 As far as I knew it, the plane's aluminium body could conduct the flow of electricity from the lightning and disappear into the air. No plane has crashed or blown apart because of lightning strike in at least 40 years. One case which I read somewhere stated that in 1962 lighting hit a Pan American Boeing 707 when it was flying over the USA. The lightning caused a spark that ignited fuel vapour in a tank, causing an explosion that brought the plane down, killing all 81 aboard. This led to rules requiring that air planes have built-in systems that ensure that a spark will not ignite fuel or fuel vapours in tanks or fuel lines. The boy sitting next to me was calm throughout the incidence. His parents seated in the row in front were panicking. The boy told me his parents had developed a phobia for lightning. They had experienced a worst situation than this one in which the plane they were in almost crashed because of lightning strikes. When the lightning strikes the plane, the pilots may be temporarily blinded. The blindness usually last a few seconds and there was no danger. After the 20 minutes ordeal, we landed safely at Heathrow. Very informative article except that the No Smoking Sign is switched on at all times on flight. Stories From The Air thank u for highlighting my mistake. I have corrected it. No worries lah, Brother Tong; to mistake is human. just to add an additional info: sputtering of copper or super thin film of Cu is deposited onto carbon fibre components that are now used in A380s and 777/ 787s to get the Faraday cage effect that u were talking about.